You save £8.04 that's 32% off! This bulb is ideal for lighting rooms and hallways where it is important to automatically have some light when it becomes dark without the need to physically switch on. This could be for security purposes where you would like a light to come on when you are not at home or for safety reasons where an area could become a hazard without any lighting. This product automatically switches ON at dusk and OFF at dawn and in contrast to other products this features dual 360 degree sensors to detect daylight from all angles. The product is ideal for external porches, walkways, paths and patios if used in a suitable enclosed outdoor fittings. The product is a similar size to a traditional light bulb and delivers a cool white light at 5000k (referred to as Daylight on the packaging) courtesy of the SAMSUNG LED chip. It terms of brightness the bulb produces 470 lumens which is a suitable replacement for a 60W halogen bulb and due to the large 270 degree beam angle in some cases the product would be sufficient for a 60W incandescent replacement. By only consuming 9 Watts this product is much more energy efficient than traditional incandescent lamps and will automatically turn off in the day time for increased energy savings. Automation in the home can make every day task easier. When coming home at night to an dark house it can be more pleasant if a light has automatically been turned on. In comparison to using timer switches this bulb will come on based on the low light level so there is no need for adjustments when the clocks go back or forwards. The bulbs uses the Edison Screw or E27 fiiting so will fit into a standard bayonet socket without the addition of any other products. 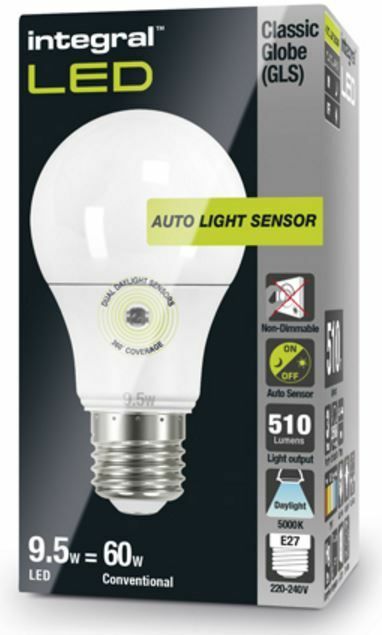 The auto sensor dusk to dawn bulb is manufactured by Integral and comes with a 3 year manufacturers warranty. 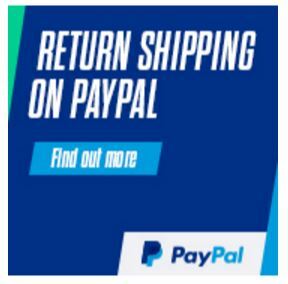 We guarantee you will not be disappointed with this product. The dusk to dawn light is also available in an B22 fitting and warm white, also as a plugin option. The lamp will switch ON at around dusk when the daylight intensity level drops to less than 80Lux +/- 30% it will switch OFF at dawn when the daylight intensity level reaches 300Lux +/- 30%. On overcast, stormy or dull days the light may stay on a bit longer. On average there will be around 12 hours of darkness over a year - Using a LED lamp will lead to significant savings on energy when compared to a conventional lamp. How does the Integral Auto Sensor lamp work? The auto sensor lamp has been designed to work in suitable external clear glass or plastic fittings - some shades may affect the operation of the lamp. Dusk to dawn lights utilise a photocell sensor some times called a CDS cell or photo resistor. Generally resistance increases as the light levels drop. This feature is particularly useful for security and safety purposes where it is important to maintain specific light levels and can be activated automatically when these light levels are reached.